Columnea nicaraguensis, in a Costa Rican forest, is readily visible high above the forest floor. These are species with creeping stems and strongly bilabiate (two-lipped) corollas. Columnea nicaraguensis is an example of a species in this section. The corolla is strongly two-lipped and with a galea (hood) formed by the fusion of the two upper petals. The bright red color is also common among the species in this section, but they can also be yellow or occasionally orange or pink. Columnea harrisii exemplifies the “bilabiate” Columnea flowers seen most often in cultivation, with top and bottom “lips”. 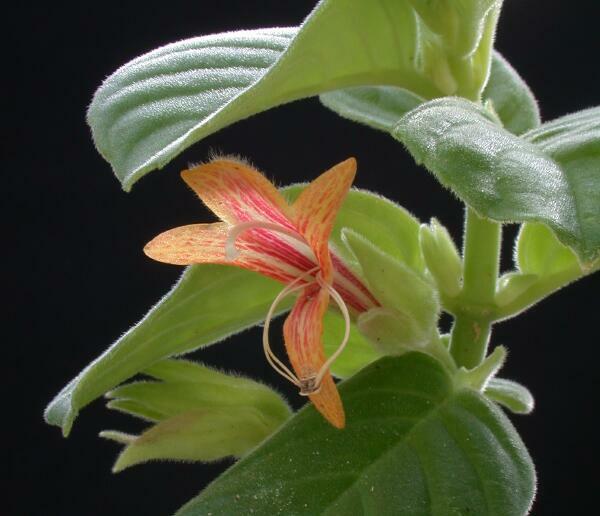 Section Columnea contains the majority of species in cultivation, and has been the primary source of hybrids. Additional Species: C. arguta, C. raymondii, C. harrisii, C. magnifica, C. microcalyx, C. gloriosa, C. hirta, C. linearis.